Serological and skin reactivity surveys indicate that fungal infections are common, but clinical disease is rare, consistent with the development of acquired immunity. Underlying acquired immunity to C. albicans, such as the expression of a positive delayed type hypersensitivity, is demonstrable in adult immunocompetent individuals, and is presumed to prevent mucosal colonization from progression to symptomatic infection (Puccetti et al., 1995). Lymphocytes from healthy subjects show strong proliferative responses after stimulation with fungal antigens and produce a number of different cytokines (Romani, 2004b). For many fungal pathogens, the effective tissue response to invasion is granulomatous inflammation, a hallmark of cell-mediated immunity (CMI). There is extensive plasticity in the T-cell response to fungi (Romani & Puccetti, 2006a). The heterogeneity of the CD4+ and CD8+ T cell repertoire may account for the multiplicity and redundancy of effector mechanisms through which T lymphocytes participate in the control of fungal infections. The flexible program of T lymphocytes also implicates the production of a number of mediators, including cytokines. Due to their action on circulating leukocytes, the cytokines produced by fungus-specific T cells are instrumental in mobilizing and activating antifungal effectors, thus providing prompt and effective control of infectivity once the fungus has established itself in tissues or spread to internal organs. Therefore, host resistance to fungi appears to be dependent upon the induction of cellular immunity, mediated by T lymphocytes, cytokines, and a number of effector phagocytes (Romani, 2004b). The clinical circumstances in which fungal infections occur definitely suggest an association with impaired CMI. AIDS and severe hematological malignancies are examples of acquired defects in T-cell function that predispose to severe fungal infections. Interestingly, however, defective CMI may also be a consequence of fungal virulence (Fischer et al., 1978; Yauch et al., 2006). Furthermore, the occurrence of severe disseminated infections by filamentous fungi in non-granulocytopenic patients, as well as in concomitance with the onset of graft-versus-host disease in bone marrow transplant recipients are compelling evidence of the pathogenic role of T-cell dysreactivity in infection. In endemic mycosis, the severity of the disease correlates with the degree of impairment of CMI, associated with elevated levels of antibodies (Romani, 2004b). Generation of a dominant Th1 response driven by IL-12 is essentially required for the expression of protective immunity to fungi. Through the production of the signature cytokine IFN-y and help for opsonizing antibodies, the activation of Th1 cells is instrumental in the optimal activation of phagocytes at sites of infection. 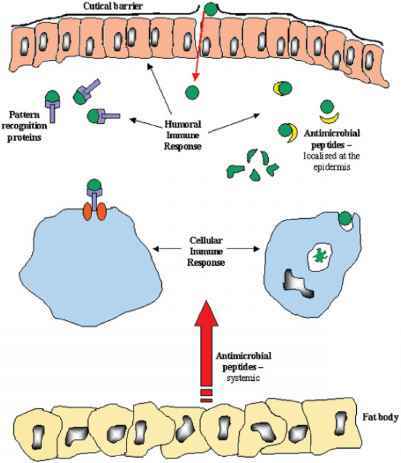 Therefore, the failure to deliver activating signals to effector phagocytes may predispose patients to overwhelming infections, limit the therapeutic efficacy of antifungals and antibodies, and favor persistency and/or commensalism. Immunological studies in patients with polar forms of paracoccidioidomycosis demonstrate an association between Th1-biased reactivity and the asymptomatic and mild forms of the infection, as opposed to the positive correlation of Th2 responses with the severity of the disease. Not surprisingly, therefore, patients with disseminated infection show defective production of IFN-y and DTH anergy, associated with elevated levels of type 2 cytokines (IL-4 and IL-5), IgE, IgG4 and IgA, and eosinophilia, which is a marker of poor prognosis in endemic mycoses (Romani & Kaufmann, 1998 and references therein). In patients with defective IL-12/IFN-y pathway, such as those with hyperimmunoglobulinemia E syndrome, fungal infections, and allergy are both observed (Romani, 2004b). Deficient IFN-y receptor-mediated signaling occurs in neonates and may predispose to fungal infections. IL-4 is one major discriminative factor of susceptibility and resistance in most fungal infections. The most important mechanism underlying the inhibitory activity of IL-4 in infections relies on its ability to act as the most potent proximal signal for commitment to Th2 reactivity that dampens protective Th1 responses and favors fungal allergy. In atopic subjects, the suppressed DTH response to fungi is associated with elevated levels of antifungal IgE, IgA, and IgG. However, susceptibility to fungal infections may not always be associated with an overt production of IL-4. For instance, although an association between chronic disseminated candidiasis and genetic variants of IL-4 has been recently described (Romani, 2004b), IL-4 or IL-5 are not always increased in patients with chronic mucocutaneous candidiasis (CMC), despite a defective type 1 cytokine production (Lilic et al., 2003). 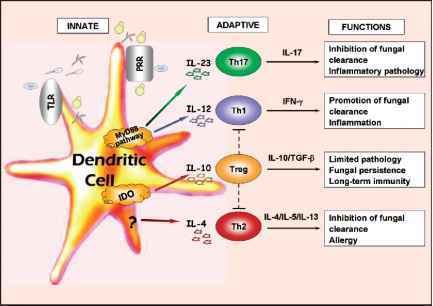 Figure 1.1 Pathways of innate and adaptive antifungal immunity: the role of dendritic cells, tryptophan catabolism, and Th subsets. 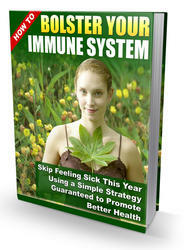 The majority of fungi are detected and destroyed within hours by innate defense mechanisms. These mechanisms act immediately and are followed some hours later by an early induced response, which must be activated by infection but does not generate lasting protective immunity. These early phases help to keep infection under control. In vertebrates, however, if the infectious organism can breach these early lines of defense an adaptive immune response will ensue, with generation of antigen-specific T helper (Th) effectors and regulatory T (Treg) cells that specifically target the pathogen and induce memory cells that prevent subsequent infection with the same microorganism. Dendritic cells (DC) sample fungi at the site of colonization/infection, transport them to the draining lymph nodes and activate disparate Th/ Treg cells in a morphotype- and tissue-dependent fashion. The activity of DC involves the pattern recognition receptors (PRR), including Toll-like receptors (TLR) and the enzyme indoleamine 2,3-dioxygenase (IDO)-dependent metabolic pathways leading to T cell activation and regulation. As the different Th cell subsets release a distinct panel of cytokines, capable of delivering, activating, and deactivating feedback signals to effector phagocytes, the activation of the appropriate Th subset is instrumental in the generation of a successful immune response to fungi. Counter-regulatory Treg cells may serve to dampen the excessive inflammatory reactions and to contribute to the development of memory antifungal immunity. Solid and broken Lines refer to positive and negative signals, respectively there is increasing evidence that IL-12 and IL-23 drive divergent immunological pathways (Trinchieri et al., 2003). Th cells primed for IL-17 production appear to have important roles in autoimmune diseases (Harrington et al., 2006). Moreover, although less clear, the production of high levels of IL-23/ IL-17, more than IL-12/IFN-y, better correlates with disease severity and immun-opathology in diverse infections (Hunter, 2005). These studies suggest that IL-12 and IL-23 have distinct roles in promoting antimicrobial immune responses and diseases in vivo. Recent evidence indicated that the IL-23/IL-17 developmental pathway may act as a negative regulator of the Th1-mediated immune resistance to fungi and played an inflammatory role previously attributed to uncontrolled Th1 cell responses. Both inflammation and infection were exacerbated by a heightened Th17 response against C. albicans and A. fumigatus. Both IL-23 and IL-17 subverted the inflammatory program of neutrophils and promoted fungal virulence, which impacted severely on tissue inflammatory pathology associated with infection (author's unpublished observations). Our data support a model in which IL-23-driven inflammation promotes infection and impairs antifungal immune resistance (Figure 1.1). Thus, modulation of the inflammatory response represents a potential strategy to stimulate protective immune responses to fungi.